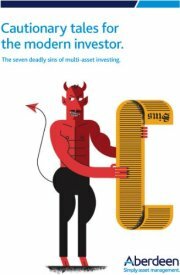 Investing is an activity that’s rife with opportunity to fall into bad habits, be led astray or make decisions for the wrong reasons. Being aware of the behavioural traps and temptations that lie in wait for the unwary investor is the first step to avoiding them. The Seven Deadly Sins were formulated in early Christian teachings to make followers mindful of man’s natural vices – lust, gluttony, greed, sloth, wrath, envy and pride. On the following pages, The Seven Deadly Sins are adapted to the world of multi-asset investment, revealing the all-too-common investor tendencies that the authors look to avoid in order to achieve reliable long-term performance.